Maynard Johnny (b. 1973) is primarily a self-taught artist who has been studying and working since the age of seventeen. He has been inspired by many NWC artists and particularly admires Robert Davidson, the late great Art Thompson, and Mark Henderson. Maynard is principally involved in graphic work, but is also designing and creating jewellery in silver and gold. Throughout his career Maynard has also been interested in, and enjoyed working with wood. He has carved a number of masks and panels. 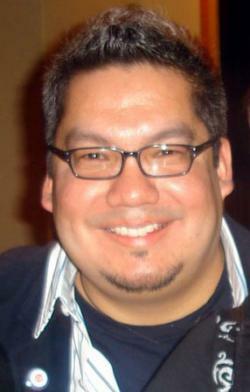 His designs have garnered him a number of awards in logo contests for companies and Native organizations. Maynard has designed a number of logos for many Native organizations as well as other companies or businesses. He was also privileged enough to design a 8-ft. by 3-ft. sculpture of a salmon that was donated to the world trade centre in New York to honour those lost in the 9/11 tragedy. Maynard has been in a number of exhibitions including a Miniature Show at Alcheringa Gallery, a Young Bloods Show at the Douglas Reynolds Gallery, and a Salish Show with Charles Elliot, as well as a few small solo shows. Maynard hopes to continue sharing his culture through other mediums such as precious metals and wood in the near future.